The push comes from Democrats, including Sen. Richard Durbin, and also from some business-first Republicans, including South Carolina Sen. Lindsey Graham and North Carolina’s Sen. Thom Tillis. This week, for example, the Senators have been meeting to develop an amnesty plan that would offer token border-security measures against illegal immigration in exchange for legalizing more than 3 million illegals — plus their future chain-migration relatives. Americans’ wages grew rapidly until the 1965 immigration rewrite expanded the inflow of foreign workers after the 1975 oil-price shock, according to data provided by the Census Bureau in 2017. Since then, wages have been flat, but that stagnation has been partly hidden by the rising quality and declining cost of many items, including coffee, entertainment, and Internet services. 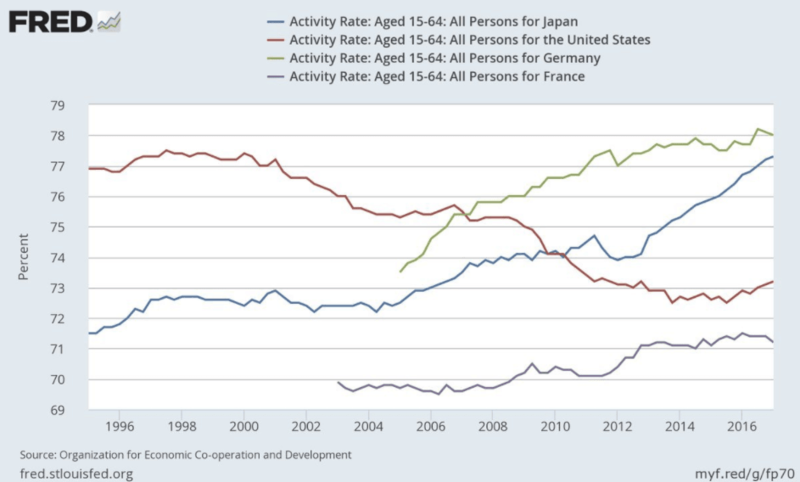 Amid the wage stagnation and the government-managed huge inflow of foreign workers, the percentage of working-age Americans who are not in the workforce has fallen below the work rates in Japan and Germany. Business groups say many Americans have quit the labor market because of easy welfare rules. House Speaker Paul Ryan recently admitted that many Americans have been pushed to the sidelines, as he sketched out a plan for welfare reform in 2018. Let’s change our welfare laws so we push and pull people out of poverty into the workforce … we’re going to be able to create an economy that produces good family-supporting jobs, higher wages, that will be there for people who are stuck in poverty and welfare to go to. Despite his press-conference focus on Americans, in 2015 and 2017 Ryan successfully pushed for an expansion of the H-2B program, which allows foresty and landscaping companies to import foreign workers for seasonal jobs. Ryan’s cheap H-2B labor helps the companies cut their seasonal and full-year payrolls, but cuts average pay and reduces the ability of sidelined Americans to take seasonal jobs. 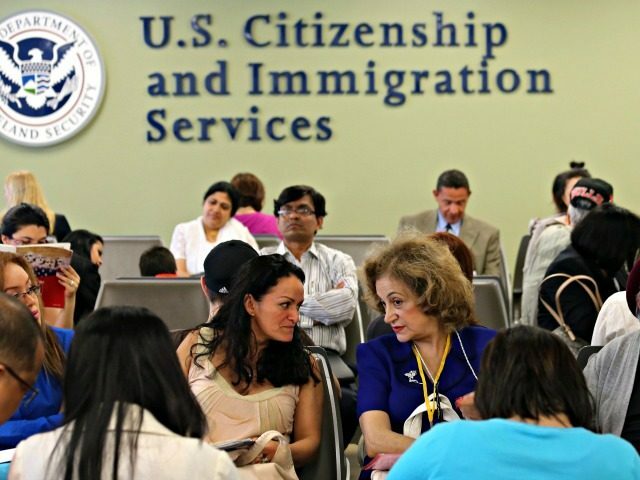 Immigration experts fear Ryan will again try to expand the H-2B program in the 2018 budget talks, which are due for completion in January. Both Republicans and Democrats are under intense business pressure to grow economic consumption and Wall Street’s stock values by importing foreign consumers and workers, instead of by growing Americans’ productivity and wages. In September 2017, for example, the business-funded Hamilton Project think-tank debated why Americans’ wages remain flat — but dismissed the impact of the federal government’s policy of annually importing roughly one immigrant consumer/worker for every four Americans who turn 18 each year. If we are going to put in place a policy agenda that addresses [national economic] growth and addresses wage stagnation or sluggishness, effectively, it has got to start with a clear understanding of the facts over the last several decades, and a clear understanding of the causes … My own view as to causation is that it is a combination of the factors I have just mentioned — technological development, globalization, and decline of labor unions on the one hand, and also the abject failure of our political system to put in place an effective, inclusive growth agenda. Subsequent panelists at the event, including Furman, dismissed the role of federal immigration policy.